A tale of doubling your money from 1 penny to 1 million pounds in 28 steps. The idea is that if this takes 18 years to accomplish my son will have a nice nest egg for him in 18 years time. This week i've been struggling with my personal cash flow. It's been just a few days since I was paid by my employer and i've paid all my bills, i've paid my credit cards more than the minimum payment in an effort to clear them off, hey I even cut them up last month to prevent using them. But i am already skint. Been looking around my house at items I can sell on eBay for the doubling challenge. I've found at this stage that selling items is an easier way of progressing the stages until later on. I found some no longer used Micro-SD memory cards from old mobile phones that were in a drawer. Thought to myself, hey if I can clear just a few pounds for these each then thats progress towards the next stage. So I listed the memory cards and calculated postage for them, costs as per eBay and Paypal fees. One thing im disappointed about by this was the amount of fees i've had to pay to achieve this step. This means i've completed step 10 and reached £5. But also i've also reached the step 11 threshold. Found some coins in the car whilst washing it today. 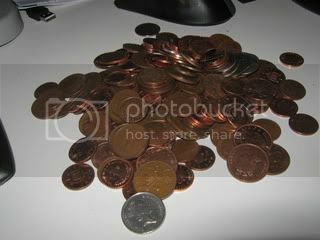 In total 9p, so will add these to my pot as I consider this found money. Well i've not thought about this blog for some time. Reason is, I bought a house and moved in. It was more important to me at the time. Also I welcomed the birth of my second son at the beginning of 2011. Now as we draw to the winter months and the nights draw in, I'm looking forward to 2012. And what to do with my time during the remainder of 2011? Well it's time to start doubling again. Well I have found my doubling jar. Its contents currenty stand at £2.51 and 10CZK (Czech Republic Krona). I must have raided the jar a few time in the last year for a odd coin or two. I dunno how the Czech Krona coin got in there, but I can not count it towards my total. Also, the Czech Republic now use the Euro so its no longer legel tender. 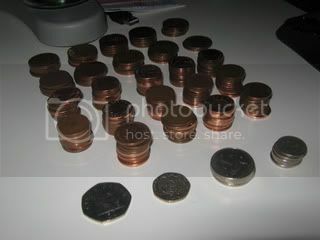 So...... my total is £2.51 in copper coins. That puts me at Step 10. Method: Got out of the when I arrived home from work and found 5p in the gutter where I usually park my car. I'm going to use the penny jar I was using from my previous attempt at doubling. I've been adding loose change to it as i've found it in my pocket over the past year. A quick count of the above coins reveals £3.74 (134x 1p, 45x 2p, 4x 5p, 6x 10p, 1x 20p and 1x50p). So adding that to the £0.20 i've found by searching gives me a total of £3.94. I've been thinking about using this source to bumps me up a few steps in the doubling but wondered whether or not it is in the spirit of the doubling process. I figure as its original intention was as part of the doubling process then, why not. I’m happy in myself about this and feel that I’m not cheating myself by jumping a few steps in the doubling process. So £3.94 takes me to step 10 :). £1.06 to find by either searching or another method to complete step 10 and on to step 11. My car is a mess. After a recent trip to visit family the car was full of mess, empty soft drinks cans, receipts and other rubbish. A quick tidy up revealed 12 pence in change, 1x 5p coins, 2x 2p coins and 3x 1p coins. This brings my total to £0.20.